Monte McCullough concludes our sermon series on the doctrine of the Word of God by looking at Isaiah 55 and the gift of how God's Word allows us to have a relationship with God. We continue our sermon series on the doctrine of the Word of God. Today, we study 2 Timothy 3:10-17 to see how the Word of God is sufficient to guide us in every life circumstance. The Word of God, Pt. 7 – Does the Bible Condone Slavery? We continue our sermon series on the doctrine of the Word of God. Today, we study Philemon to see how the unfolding story of God's redemption in the Bible helps us to interpret particular texts about slavery. The Word of God, Pt. 6 – What About the Law? We continue our sermon series on the doctrine of the Word of God. Today, we study Jeremiah 31:31-34 to see how the Bible helps us interpret the Old Testament Law. The Word of God, Pt. 5 – Who Compiled the Bible? Joe Carter continues our sermon series on the doctrine of the Word of God. Today, we study John 10:1-5 and discuss how the Bible was compiled into the 66 books that we have today. We continue our sermon series on the doctrine of the Word of God. Today, we study John 5:37-47 to see the entire Bible is about Jesus Christ. We continue our sermon series on the doctrine of the Word of God. Today, we study John 17:6-21 to learn about why the Word of God must be infallible and inerrant. We continue our sermon series on the doctrine of the Word of God. Today, we study 2 Kings 22 and 1 Timothy 1 as we compare two different postures towards the Word of God. 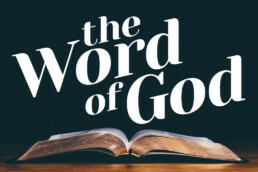 We begin a new sermon series studying the doctrine of the Word of God. Today, we begin by seeing how God created humanity to need His Word.